The Silentaire Sil-Air 150-50 Ultra-Quiet Compressor offers both automation plus noiseless performance when filling up tires and other objects with air. 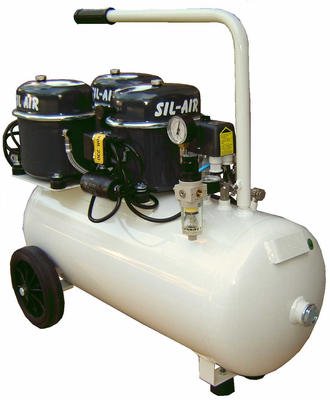 The Silentaire Sil-Air 150-50 Ultra-Quiet Compressor provides automated, noiseless performance for people who need a machine for inflating air into objects. The line and tank have pressure gauges, and the machine also has a safety valve. This pressure regulation helps ensure long-lasting performance and prevents injury and overfilling of air. The heavy-duty ½ horsepower pump provides increased reliability, and the carrying handle makes the Sil-Air 150.50 easier to move around the yard. It is conveniently build portable enough for taking with on trips, too. It can fit easily into a corner of a garage, shed or basement and stores easily in a large vehicle. It has a 13 gallon tank, provides 84-114 PSI Op-Pressure, and requires 220Volts/60Hz of power. It works well for both personal and commercial use depending on company or individual standards.